Today’s Vintage May guest needs practically no introduction! I’m sure you all know the lovely Anna from Noodlehead, and her fabulous sewn creations. We’ve been blog pals since way back when-seriously since the beginning of blogging, Anna? haha well I always love checking in with her and she is so sweet and sincere. 🙂 You’ve of course seen some of her tutorials, no doubt one of them being the gathered clutch. Who hasn’t made one of those? Besides being the queen of bags, wallets, etc…(plus creating awesome patterns! ), she has tutorials for adorable skirts, a car pillow, and this super useful diaper pouch. (I would know, she sent me the pink one when I had Charlotte and I still use it to this day) She’s here today with a vintage-modern tunic-that fabric is to die for! Take it away, Anna. I gave you a little hint earlier this month. I was digging through my brain and wanted something simple, a fun little tunic. It has a retro/vintage vibe to it, especially if you change up the fabrics. I was to make about one hundred of these, they were so fun to make! I think of little details are what makes garments really stand out. Any opportunity to add a different print or trim really makes it so much more special. I added a hem facing, button placket facing and bias tape trim for this tunic. The pleats at the front and back of this tunic make it really cute without being frilly or overly girly. And I think the sleeveless option really makes it comfortable to wear as well as making it something you can layer with a long sleeve shirt for colder weather. These bunnies are to die for! It’s an older print by Anna Griffin and I just love it. Those little bunnies make me happy! And the bias trim/placket fabric is by Kokka. If anyone is interested, I was considering turning this into a pattern perhaps with sizes 12 months – 5/6T Let me know in the comments, I think can be a really versatile pattern with fun options! Thanks Anna! I hope she does make a pattern-it looks so versatile! See what Danielle from My Sparkle has made today over on Skirt as Top! It’s a gorgeous tunic. I was looking for a link to a pattern then saw your suggestion of making a pattern – sounds great to me! My girls are 2 and 4 (and 12 weeks!) but I guess I could adapt if you made one up in the sizes you said. This top is so cute and perfect for the hot summers here in South Carolina. I would love this as a pattern! Please turn this into a pattern. This is one fabulous little top. My daughter would look so sweet in it! it’s adorable!!! my girls are 9 and 11, so probably too big, but i’m sure others would love to be able to make it! this is a beautiful top- just the right amount of girlie :). a pattern for it would be amazing! thanks for sharing- you’re always a great source of inspiration! Yes, yes, yes! Please make a pattern. Adorable. Please do turn this into a pattern! I love the Vintage-y Dress, but the pleats in this make me much happier. I would love this as a pattern! So cute! I love this pattern! It’s so adorable. I would love to make one for my daughter! Adorable! Please make a pattern! I have 4 nieces that need this! This tops is beautiful and perfect. I lovely the clothes. Congratulations. How about making it adult sized too??? 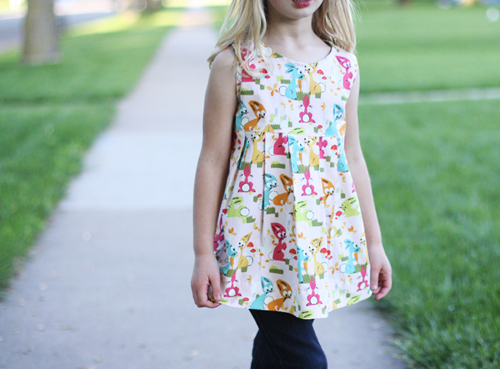 What a sweet little tunic, so versatile and I would LOVE to see a pattern! Honestly, I would love a tutorial or pattern for grown-up girl sizes too. I have teenagers with terrible fashion sense (at least, if I like it, they hate it 🙂 but I LOVE this tunic top. It’s really cute and fresh. Love the photo from the back—I really like clothing that is as beautiful in the back as it is in the front and this one is! 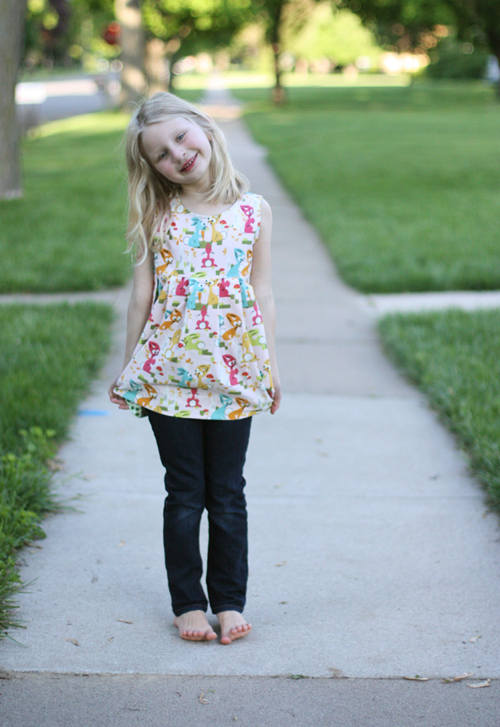 I’m such a fan of your patterns Anna and would adore to make that tunic for my 2 and 4 years old girls. Love love love! I just found your blog a week or so ago and I love it! Thank you for the work it must take to keep it up. This top is so adorable. I have 3 granddaughters that would so cute in it. Please make the tutorial up to a size 7/8. Thanks…..I’ll be watching for it. ha! totally jess, it seems like so long ago (definitely the beginning of when I started blogging!) 🙂 thanks for having me and all your kind words!!!! Hope you have a lovely weekend with your family. Of course a pattern please! I would love this pattern in 18 month for my grand daughter! I think this is adorable! 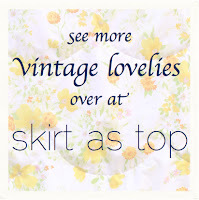 I especially love the hem facings; they put it over the top (even though they’re hidden). My daughter is almost 2T. I would love it if you made a pattern! I want one in my size too lol. Love it, Anna! I vote yes pattern! pattern yes please! Very cute!! I would LOVE to have a pattern it is adorable! I love all of the little details too! Would love the pattern! So cute! I would love to see a pattern for this. I love the sleeveless but would adore the option of a short or even 3/4 sleeve (I am terrible at drafting my own). Those pleats are so amazing. Super cute and LOVE the bunnies! Please do this up as a pattern. I’d love to make a few for my daughter! I would so love a pattern to make this. 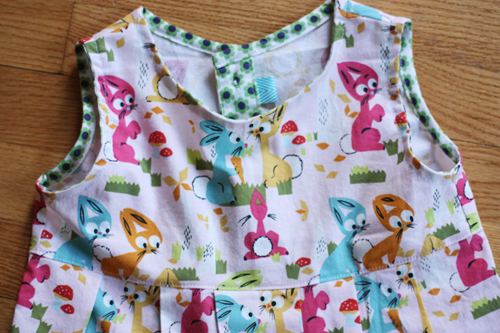 I have so much fun sewing clothes for my friends kids. Also would you consider adding sleeves to it so that it could be made as a winter or summer top. Otherwise I will just put a long sleeve top under it. The shape of this top is just fantastic and I hope that the pattern is available soon. I don’t even have a daughter or granddaughter to sew for and I totally love this! Definitely the pleats make the cuteness factor soar. Make it into pattern is my vite, too. I don’t even have a daughter or granddaughter to sew for and I totally love this! Definitely the pleats make the cuteness factor soar. Make it into pattern is my vote, too. Yes please make it into a pattern! It’s so cute! Great tunic Anna! I would love for you to make a pattern! i’d love a pattern for my grands…2T and 6. Yes! Absolutely, a pattern would be fabulous! I would love to see this made into a pattern. Super cute top. I too, would love to see a pattern for this cute tunic! Pretty please? would love to see a pattern for this shirt but please make it up to a 7/8. 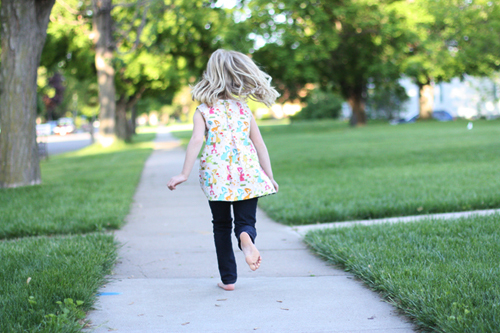 I have a 6 year old that wears a 8 and it is really hard to find cute clothes/patterns in her size that still look like a kid and not a teenager.